The V-mod from the company Komodo creates the ultimate on the go concentrate heating experience with a long-lasting 900mAh battery and versatile variable output control all wrapped up in a discreet and travel-friendly package. You have three preset voltage output settings that can be selected at anytime to accommodate the widest range of concentrated material. While the device is powered on, quickly press the single control button three times to switch through the different output levels. You are also equipped with an advanced pre-heating feature that will ultimately help you to minimize waste and get the absolute most out of your material. While the V-mod is powered on rapidly pressing the control button two times will start a pre-heat cycle. 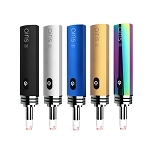 This uses a low (1.8V) output to heat your concentrate cartridge up to 15 seconds at a time in order to loosen any material inside and allow it to easily reach your heating element. Inside every Vmod Cartridge Battery there is a lithium-ion power source packed inside with a massive 900mAh capacity. With a battery of this size you can expect it last for days at a time on a full charge, even for the heaviest of users. When the time to recharge eventually comes you have a micro-usb charging cable included that supports passthrough charging so you can get in those must-have sessions while you recharge. Each Vmod Set from Komodo can be purchased in either a Battery Only Basic Set or for small additional cost you can upgrade to the Full Kit complete with refillable essential oil cartridge. 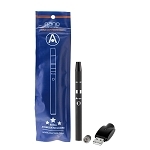 The small extra charge is quite worth it, this attachment has an all ceramic heating element that will create a quality of vapor unlike you've ever tried before. 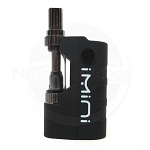 It is easily refilled from the top absolutely no waste/mess and it instantly connects to the V-mod's battery with the ultra convenient short magnetic ring connector included with each set. Treat yourself to the Vmod Cartridge Battery today, whether you go for the Complete Kit for Battery Only version you will not be disappointed!